By Ahmed Bilal on December 14th, 2010. By Ahmed Bilal on December 13th, 2010. By Ahmed Bilal on December 11th, 2010. The Castrol Rankings give you the most accurate analysis of who the best footballers are over the last 12 months. Football-inspired clothing as featured by GQ, Complex, FourFourTwo and more. 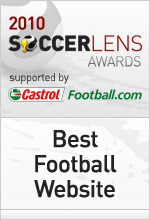 Join Soccerlens Awards in discovering - and celebrating - the best in football.